Just six years ago, Mike Jenkins was a first-round pick with America’s Team. After his second season with the Dallas Cowboys in 2009, when he had five interceptions and 49 tackles, he was selected to the Pro Bowl. Jenkins seemed destined for a long, distinguished career in Texas. But since 2011, Jenkins has been slowed and sidelined by injuries that inhibited his performance and eventually cost him his starting job last season, the final year of his contract. Now the Raiders are taking a rather low-risk gamble by signing Jenkins to a one-year deal, according to ESPN. Jenkins will now pair with Tracy Porter, another recent signee, to give the Raiders a pair of once-sterling cornerbacks eager to get their careers back on track. If the two regain their form, the Raiders will have a bargain; if they don’t pan out – just as veterans Ron Bartell and Shawntae Spencer didn’t last season – Oakland isn’t on the hook for long-term deals. Last season, Jenkins, now 28, was pushed out of the lineup in Dallas by rookie Morris Claiborne and free-agent pickup Brandon Carr. 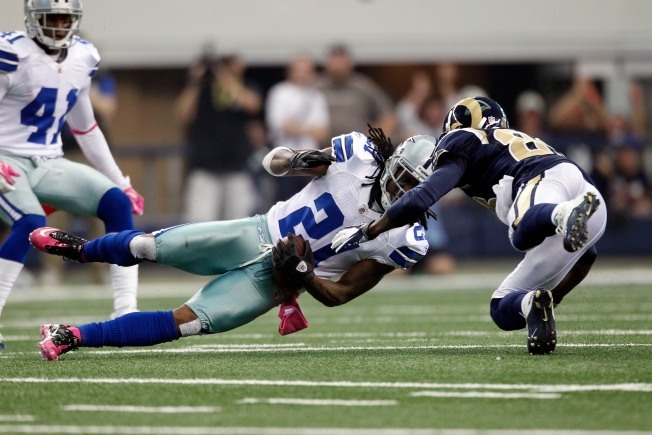 But Cowboys owner Jerry Jones said last month that he believes Jenkins can still play. The Cowboys and Jenkins had a falling out and never could repair the damage. During his time in Dallas, Jenkins started 48 games and intercepted eight passes. He now joins a team in Oakland with Porter at corner, as well as Phillip Adams, Chimdi Chekwa, Brandian Ross and Taiwan Jones. Both also have something to prove, and for the Raiders, that may be a very good thing.